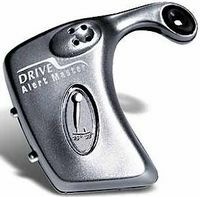 Last week was my first podcast and then Friday afternoon a camera crew from my local NBC affiliate (WVIR, Channel 29 in Charlottesville) came by to interview me about the Drive Alert. Back on January 8 I wrote about the device (above), created to awaken and alert a somnolent driver wearing it before it's crash time. A producer with NewsProNet down in Miami happened upon my post and emailed me to ask about my experience with it. Then she called and we chatted a while and I guess I must've made a good impression 'cause she asked if she could send over a camera crew to interview me about it. You know me, I'll do anything so of course I said yes. And so it was that an interviewer and cameraman came by Friday morning last and spent a while interviewing me, following which we all went on a pleasant drive during which I put the Drive Alert on and then proceeded to pretend to fall asleep so they could film, in a real–life setting, how it worked. No, the cameraman wasn't strapped to the top of my car with his camera poking in the window: he sat inside the car filming. So look for me on a news feature segment sometime in the near future. I have no idea when or where it'll be on: the company that shot the feature syndicates its products to whomever wants to buy them, but the producer said that the features are usually seen on most stations around the country at one time or another. Woo–woo: looks like things are starting to pick up around here media–wise. Time to hire a press agent and publicity team, don't you think? Or should I give it a little more time? OH NO! Are you going to go all Hollywood on us and sell your soul to the devil? Give it more time! Things are moving too fast! It's kind of unthinkable, like William Wegman doing dog food commercials or Bob and Ray selling mufflers or something. However, I'm ashamed to admit, I'll be eagerly watching. Oh God, does this mean I have to start watching TV?